Why are more and more people choosing wood countertops? The natural beauty of crafted wood is unsurpassed for its warmth and versatility. Designers everywhere are rediscovering the unique cachet and richness of wood as a signature piece or as a complement to their overall design scheme. Not only are wood countertop surfaces durable, but they retain their appeal year after year. Why choose a wood countertop from Canadian Butcher Block Company? 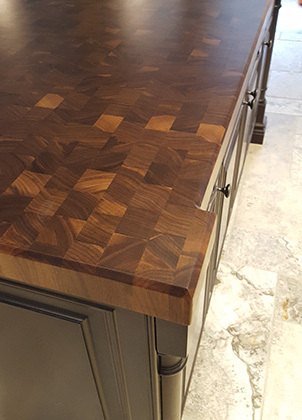 If you are looking for the finest in workmanship at an affordable price, Canadian Butcher Block Company can produce the custom piece that meets your needs and expectations. Through experience and commitment, we have developed our own unique production methods that ensure a finished product of the best quality, durability and beauty on the market today. Quality defines the craftsman is more than our shop motto. It sets a standard that we strive to reach every day.